The following is this week’s issue of the “#DTJax Weekly Update” e-newsletter. To receive this in your email inbox each week, sign-up here. #DTJax. There’s an App for that! Thank you for making Saturday’s #DTJax Gala: River of Dreams a great success! Check out all of Severine Photography’s beautiful photos of the Gala! Bike to do your pART at April’s Art Walk! Ride your bike out to Art Walk in April as DVI teams up with USGBC to bring you the newest ideas in sustainability, social responsibilty and the environment from local companies, businesses, and organizations! Learn how to do you pART while enjoying Art Walk’s artists, food trucks, and live music! 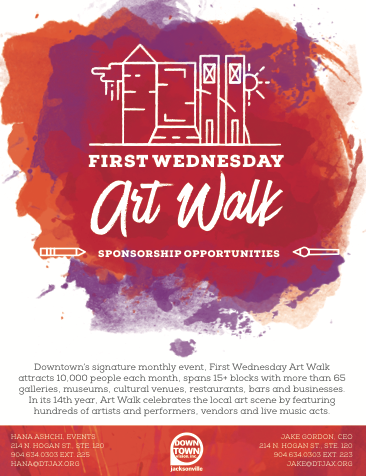 Downtown’s signature monthly event, First Wednesday Art Walk attracts 10,000 people each month, spans 15+ blocks with more than 60 galleries, museums, cultural venues, restaurants, bars and businesses. In its 14th year, Art Walk celebrates the local art scene by featuring hundreds of artists, performers and live music acts. Be a partner today! Download the kit here. Downtown Vision, Inc. released an 18-month summary on the state and growth of Downtown Jacksonville. This report provides details on development successes and announcements, office and employment trends, residential growth, retail mix, arts and culture, tourism, transportation and more. Read the report in it’s entirety on our blog or visit dtjaxreports.com to download the PDF. Have you ever wondered, what exactly does DVI do in a year? Check out our latest Annual Report, which highlights accomplishments and financial information for fiscal year 2015-2016. #ArtWalkJax returns for a “Shamrockin’ Downtown” in #DTJax on March 1! Make plans to browse hundreds of local artists, enjoy local food trucks and live music by the JFRD Pipe and Drums, Stank Sauce, Limitless and more. Visit iloveartwalk.com for more information and the full line up of festivities. Volunteers are needed! Come out and support your favorite businesses and artists and receive some cool perks in return! Early bird ticket prices end this Sunday, 2/19! Join us for the 2nd Annual #DTJax Gala! Saturday, February 25, 2017 | 6-9 p.m. Early bird pricing ends February 19. Volunteers needed for #DTJax Gala! Volunteer opportunities are now available for the #DTJax Gala! Come volunteer at one of the most photogenic backdrops of our city, Friendship Fountain, and help benefit a riverfront activation initiatives program. 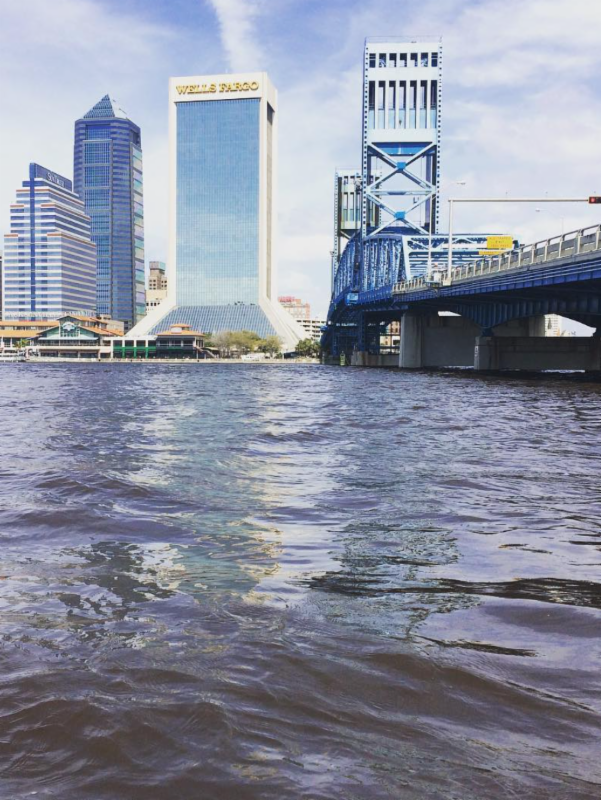 Take our DTJax Employee & Resident Surveys! Each year Downtown Vision evaluates the state of Downtown Jacksonville and collects data on how to improve the Downtown experience. If you live or work in DTJax (Northbank, Southbank, Brooklyn/Riverside Avenue, LaVilla or the Stadium District) we want to hear from you.Respondents will be entered into a drawing to win a $100 gift certificate to the Downtown restaurant or retailer of their choice. A winner will be selected in January 2017 and contacted via the email provided. Take the DTJax Employee Survey here. Take the DTJax Resident Survey here. 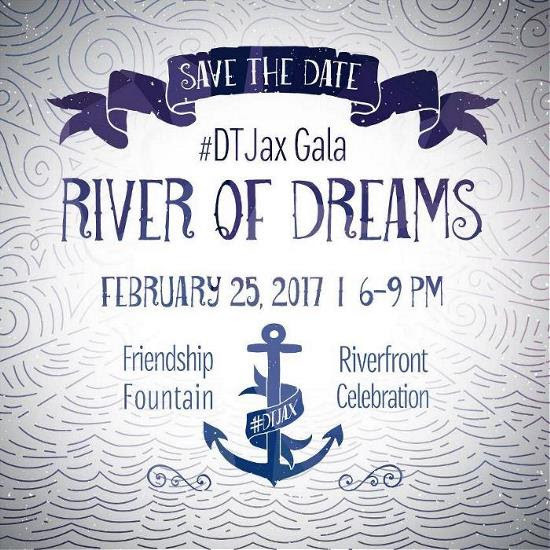 Get your tickets for the #DTJax: River of Dreams Gala today! Early bird pricing still available. Feb 10: Willie Moore, Jr.
Buy your tickets to the #DTJax Gala: River of Dreams! February Art Walk Volunteers Needed! Share the love at #ArtWalkJax and support all of your favorite local artists, performers, musicians, food trucks and businesses. Jan 17: Why Does Art Need War? © Downtown Vision, Inc. All Rights Reserved.